When you send us your prayer request it is immediately printed off and given to one of our Prayer Ministers in the World Prayer Center who joins with you in prayer for your needs. Your prayer requests are placed on our World Prayer Center Prayer Altar and are prayed over every day for the next thirty days. We believe that Prayers are answered when someone cares and we care for you. Are you or a loved one going through trials in your life? No matter what your need, God has the answers to heal even your deepest, most painful hurts. Let Morris Cerullo pray with you so that you can know the peace that comes with turning your troubles over to God. 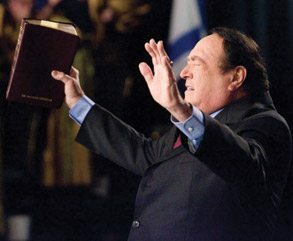 Click on your specific prayer need from the list provided on the right to see Brother Cerullo and hear his words of healing, prayer and comfort. You may also submit your prayer needs below which will be sent immediately to our Prayer Ministers at the World Prayer Center. You will receive prayer and important ministry communications and updates.